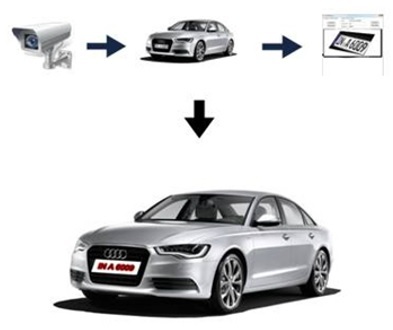 License Plate Recognition or LPR is a technology that is capable of processing images to identify vehicles through license Plates. With increasing security concern surrounding crimes and violence, LPR technology plays a vital role, and is typically used in numerous traffic applications for security. LPR is known to have originated in UK by the British Police Department in the year 1976. The first released LPR only functioned under laboratory conditions that were limited and produce low-accuracy readings. Through time, innovations were made and a working model while improved was still not operating enough to properly produce accurate readings. After several decades, LPR has greatly evolved. Previous limitations caused by vehicle speed, angular skew, light fluctuations, character recognition and segmentation have been solved through the help of advanced algorithm technology. Furthermore, previous prohibitive cost have now been reduced thanks to the relatively inexpensive price of computer microchips. LPR involves capturing images or photographic videos of license plates. Sequences of algorithms will process the images to provide conversions of alpha numeric text of each frame a car appears. Algorithms are responsible for providing accurate recognition and are the core dependence of the technology. LPR utilizes 6 primary algorithms in order to be successful. 1. Localization. This is an algorithmic function which determines if a certain aspect or image of the vehicle is indeed the license plate. This alteration can separate other images such as the headlight, grill, mirror, sticker and many more from the license itself. But since there are other vehicle’s parts that looks like or have a shape of a license plate, additional algorithms are required to confirm that the object identified is indeed a license plate. 2. Orientation and Sizing. These are algorithm components that adjust for the license plate photo or images angular skew to accurately correct, sample and proportionally recalculate in order to achieve an optimal size. 3. Normalization. This specifically functions for regulating the brightness and contrast of the captured image or frames. 4. Character Segmentation. This is responsible for locating a license plate alpha numeric image. This also further looks for characters of the same equidistant color as well as font structures. The individual character will be separated and will subsequently be processed by the OCR (Optical Character Recognition) algorithms. 5. OCR. This translates the captured image to an alpha numeric entry of text. 6. Geometrical/Syntactical Analysis. This algorithms works in a step-by-step process. The next algorithm will not work unless otherwise the prior have completed their job. Vehicles come in a variety of designs, colors and shape. The task of the algorithms are complicated and have lots of functions. Furthermore, different regions have different licensed plate styles requiring algorithms to be adaptive to comply with specific requirements and meet the extensive individual criteria. © 2018 Visec Sub Sahara (PTY) LTD. All Rights Reserved. All copyright, branding and/or trademark claims to material are made in South Africa and protected under International law.